Ah December 30. The second to the last day of 2003 and the last update of this year. And what is the update you wonder...it is my review of the DVD, Tom and Jerry: Paws for a Holidays. This release seems slapped together to me and it's rather lack luster. Should you get the DVD? Well, I'm on the fence...I'd say yes, since it's Tom and Jerry on DVD and there is no new news on the Box set. However, I'd also say no, since there is a Box set in the works and from what I understand they are taking their time to make it right. So I'm undecidedly neutral on this matter. Hope you all had a very Merry Christmas and may you have a Joyous and Happy New Year! Merry Christmas to All! And to All a Happy New Year!! I finally picked up the Tom and Jerry: Paws for the Holidays DVD. I haven't watched it yet, the craziness of the holidays and all. Anyway, look for a review sometime in the next couple of days or so. Lot of updates this Sunday the Seventh Day of December Two Thousand Three. I've updated the Episode Guide with new information. Basically, I added the 48 Cartoons from the 1975 Tom and Jerry. Many Thanks to Aaron Handy III over at Aaron's New Tom & Jerry Information Site for providing the information for this era. Thanks Aaron!! Thanks to my friend Peter, I have some information on Scott Bradley, the composer of all of the First Series Tom and Jerry Cartoons. Rumblings in the distance...news from the far corner of the web are brought by the winds of December 2, 2003 and they bring news of DVD. It’s not a box set: they came as 6 separate DVDs with no brochure inside, although there are some nice notes on the cover. The artwork is a modern representation, brightly coloured and cute but far from original. The cartoons are 001 to 093 with the exception of 077 (Just Ducky) – don’t know why that one’s missing – probably a production mistake. They are quite nice quality and the sound is terrific compared to the normal videos. I can confirm that they don’t appear to be pirate versions (that was, of course, a concern) since the quality, the production and the hologram all point to being an authorized and quality run. However, the sound is not tightly synchronized to the picture. On the whole, the sound is about 0.5 of a second in advance – very disconcerting. The DVDs are obviously created for the Chinese market since the default language and subtitle is Chinese. Of course, this is changeable but the menus to change the language are also in Chinese. Whoops! Once you’ve figured it out, it’s not too bad. The opening titles start not with the MGM lion but a logo for Buddha Videos who must have remastered – though they can’t be too proud of the job they’ve done on the sound. However the Buddha Video logo disappears when the T&J head-shots come up. Still, it’s horrible to see a logo other than MGM, especially since many of them are different and represent the cartoon design/history. On the whole, not a set to buy, although if there is no censorship they might have some value. I can't Believe it's December 1, 2003 already! Man! Where did the year go??? I came across the Japanese DVDs as an unbelievable price recently. Check out http://www.anisaki.com who have the 6 DVDs as individual volumes or a 6-volume set for only $45.95 + $5 postage. The set covers up to TJ093 (Designs on Jerry). The Region coding on the DVD's are Region 0 so I think that all DVDs can play them. Also, after looking around the site, there are some things on that site that are inappropriate for minors. Parents be mindful if you start looking around for other things besides Tom and Jerry. This is not the Box set that has been rumored to be in the works through Warner Brothers. No news on that...yet. What am I thankful for! All you guys for coming to visit this site. Thanks sooooo much! Well, I haven't heard anything back from anyone at BBC's Radio Five Live (http://www.bbc.co.uk/fivelive/) in regards to a stream to the interview that I did on the 17th this month. So, I will be putting up, today the 20th of November, the recording that a friend of mine did of the show. It's a 3 1/2 minute interview and it deals with cartoon violence and Tom and Jerry's impact on it. The interview was conducted over the phone with Matthew Bannister on his "Under The Covers" show.So here's the interview: Rome's Interview. Just finished! It was a cool conversation about cartoon violence. Thanks for having me on the show guys! Today is November the 17th and out of left field comes some nifty stuff. I will be on the BBC's Radio Five Live at what I believe to be around 7:30pm EST. I don't know how this works for certain, but you can check it out here: http://www.bbc.co.uk/fivelive/. * Updated the Games page with Screenshots for Infurnal Escape. * Updated the Games page with Screenshots for Tom and Jerry: War of the Whiskers for Xbox and Game Cube. As well as adding the specs for the games. The Game will be release November 17, 2003. Ah Monday, Novemeber 3, 2003 and it's over 70 degrees Farenheight in the Midwest...ahhhh...anyway, I've updated the links...added some new merchant links and cleaned up the layout a bit. Ok, I know updates have been really slow...my only excuse is that I've been really really busy. So to make up for it, I'll be updating this site soon. I have a few images that I'll be putting up. Look for them in the next couple of days. Also, I went through and cleaned up the links..however, since I changed a few things to the code the new links page won't be up till sometime Monday. My answer is this: I have no idea. I haven't seen Tom and Jerry Halloween costumes in years, probably since the Tom and Jerry Movie came out. You may want to try asking Costume shops or those that specialize in Halloween stuff. They would have a better idea than I. On a side note, if anyone does know where one would find Tom and Jerry Halloween Costumes, I and many other people, would like to know. Continuing in the tradition of great fanfare for Tom and Jerry DVD's...the latest DVD, "Paws for the Holiday", is being released 5 days from now (October 2, 2003). Order it from Amazon.com, buy it when it comes to Best Buy or wait till I buy it and review it and then you can decide what to do. Today is Saturday, September 13, 2003 and In honor of that I have added 21 images to the picture gallery. Many Thanks to Scara for providing some more images! With these images that Scara has provided I was able to fill in some missing images to the Characters page, today the 8th of September. I would like to thank my new friend Scara for providing some vid caps for all to enjoy on this day September the 3rd of the year 2003. There are 24 pics to enjoy: 16 of the Dancing Bear from "The Downbeat Bear" and 8 of Clint Clobber from "Barbeque Brawl". I've also updated the characters page with the pictures that Scara has provided. By the way, I would like to take a moment to say Thank You to all who visit and enjoy this site! The last Weekend of August 2003. Where has the summer gone?!? Anyway, I just picked up "Tom and Jerry: Hijinks and Shrieks" today. I will be watching it shortly and then I will get on the soap box to proclaim my review. On a side note, If anyone has any information about the "Tom and Jerry Kids" show that ran between 1990-1993, I'd really appreciate it. I am aware of the information at the Tvtome but the information is not as concise as I need it. Drop me an email if you have info. Finished watching Tom and Jerry: Hijinks and Shrieks, Rome approaches the soapbox. The picture quality is great considering how old some of the prints are. The sound isn't too shabby either. It's in stereo from its original mono sound so for those of us that grew up with them it's sort of an improvement in that it is cleaner. Everything is uncut, for the most part. Just like the previous DVD's Warner Brothers released, you can select Play all and watch all 7 toons straight through. 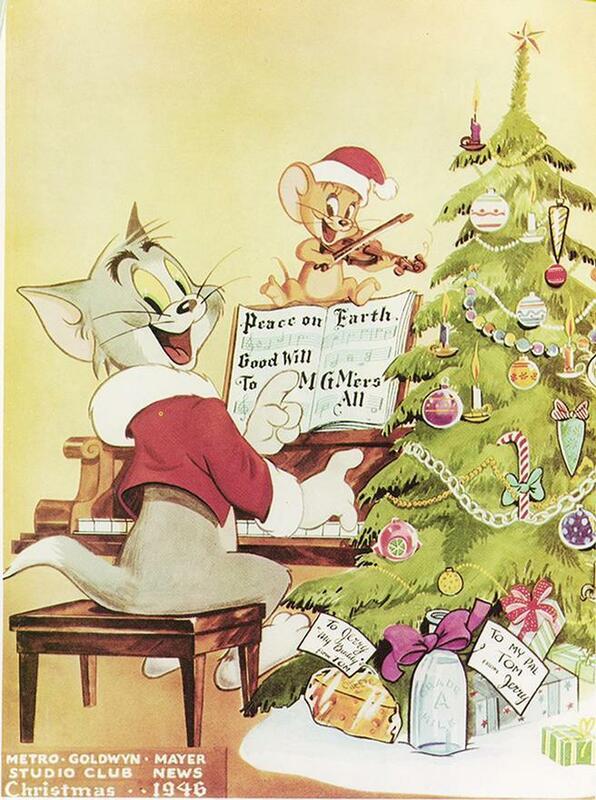 I like the fact that they included 2 Chuck Jones Tom and Jerry. Not too impressed with the Extras. 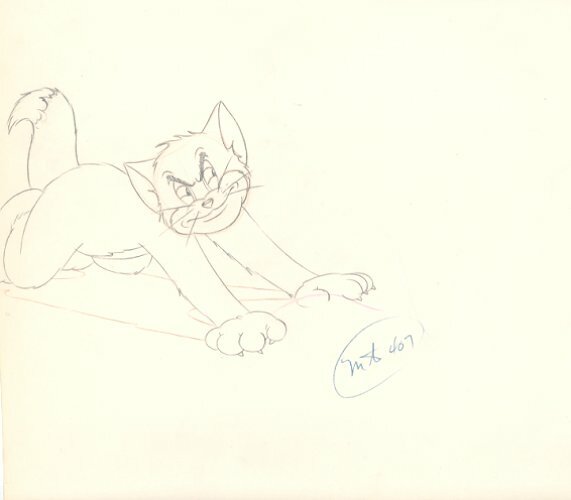 "How to Draw Tom and Jerry", funny looks like the same 2 minute speed drawing from Whiskers Away. Bios cute, but could have been more. Jerry's Spooky Sprint Challenge...um...no offense to those that made it, but WHY IS THIS ON THE DVD?!?! It looks slapped together and cheap...and I'm going to stop there cause I'm being nitpicky. Those that were originally in letterbox are still in pan and scan. Jerry's Spooky Sprint Challenge. Ok I'm not really impressed with this DVD, but the fact that Tom and Jerry are on DVD makes me happy. Plus this DVD does have 2 Chuck Jones era Tom and Jerry's. Anyway, should you buy it...It's Tom and Jerry, of course you should. But, since there is word that a DVD Box set is being worked on you may just want to wait for that. (No, I don't know when it comes out or any other details. I wish I did). Only 1 more day till Tom & Jerry: Hijinks & Shrieks is released! Ok, I've added new wallpapers. Thanks to Scara for supplying the new wallpapers. There are 16 new ones! I've also added some VHS information on some out of print tapes and added some info on the first Tom and Jerry DVD (which you should already own!). Check it out, here. Today is Saturday, August 16th, 2003 and I have devoted this weekend to working on the Tom and Jerry site. What does that mean to you, the fan, well, not much. See, I'm fixing some of the code on the site. I've went through a lot of the pages and cleaned things up. "Gee, Rome, this update is anti-climactical. We thought you were going to add something new to the site..."
- I will be adding a few new wallpapers. NOTE: THE SOUNDS PAGE WILL BE TAKEN DOWN THIS WEEKEND. IT WILL BE BACK UP ON MONDAY.. I have re-coded the page and there are a few things that I am unable to do at home and must do at work on Monday. THIS IS ONLY TEMPORARY! Only 3 more days till Tom & Jerry: Hijinks & Shrieks is released! I love Comic book Conventions! I just got back from the Wizard World Comic Convention in Chicago, today August 10. And let me tell you! Comic Conventions are gold mines for finding nifty stuff! One nifty thing that I was able to afford was some original Tom and Jerry Comic Art. :-] So to share with everyone I scanned it in a put it in the pictures gallery. It's on the last page. Also, for those of you that love to color, 2 of the panels have been enlarging for print so that you guys can download and color to you hearts content. More news on the DVD front, brought to you today the First of August and sponsored by the letter "T". Here's the Thread if you are interested. "...wanted to mention that I was able to purchase a 10 volume, 5 dvd set of the MGM Tom/Jerry cartoons off eBay. It was region 0, so it plays fine in my dvd player or computer. The quality is wonderful (this isn't a duped set, it's an original). It's in English, with Japanese subtitles as an option, but RUSSIAN audio as an option. I don't think it's the Asian version you link on your site, because that set has a different order of episodes when I compared it to mine. This set almost seems like a European version. It's from WB, so I'm betting that this is the basic set that the WB will eventually release here in the States (the one we've been reading about recently)." Just thought I'd pass the info off to you guys. http://hallkidsfiction.com and http://www.target.com both mention a dvd called "Tom and Jerry Collection" for $30 USD to be released September 16, 2003. No major details...hmmm could this be the box set?? I don't know. On top of that DVDtoons.com mentions much much more! Tom and Jerry: Paws for a Holiday is going to be released October 7. No mention on whats on it except that it has Tom and Jerry plus a music video. More news as I get it. Class dismissed. They are part of HKFlix.com. The DVDs are produced in Chinese. They have English soundtracks and spoken word as well as many Chinese styles and subtitles. They are fair quality. No worse than the ones on television. The opening credits block the MGM logo and show a "Buddist Video" logo. The menus are in Chinese but it's easy to navigate the disk. Has scene selection and will play one after another without going to the menu. I received my six disc set yesterday. Not bad for $45.95. For some reason the same discs are $75 on HKFlix.com but they show the covers on their site. The discs are Region 0 to play anywhere. I don't think this is the rumored DVD boxset that Warner Brothers is working on. In other news! "Tom and Jerry:Hijinks and Shrieks" is being released on August 15, 2003. I found it here on Amazon. I have yet to find out any specifics about this DVD. I've been to several sites and only found it on Amazon and dvdplanet.com. I think this may be a NEW Tom and Jerry cartoon, much like the "Magic Ring" was. I guess we'll find out next month. I'm looking to expand the episode guide. I would like to include Tom and Jerry Kids. I can't seem to find anything too indepth. Soooo, I request this day the 22nd of July, if anyone has ANY information on the episodes that ran on Fox, during 1990-1993, please E-MAIL ME. As I said earlier this month, an Update! Today is July 20 of 2003 and I have pushed up 26 images. Most of the pictures I got off of cartoon network many a moon ago. Enjoy. I'm working on getting some more sounds but before they go up I'm going to be revamping the episode guide. I'm toying with the idea of making it a searchable guide. I'm not sure yet. It's still in the early planning stages. Keep an eye open for that. Once I'm done with the revamp I'm going to work on getting some new sounds up. By the way, I want to take this moment to say Thanks to everyone that comes and visits this site. It's really cool talking to other Tom and Jerry fans out there! Thanks for all the support! Happy July 2nd and almost Independence Day! Again I have nothing substantial to offer in terms of really news about the DVD's. So right now in my mind it still exists as a rumor. I've been asked a few times about a quote, that was stated in 2 Tom and Jerry Cartoons: "Mouse Trouble" and "The Missing Mouse", after Tom gets pummeled really badly he sticks his head out and says "Don't you believe it", and where it is from. Well, after a few inquires (Thanks BCDB and the guys in the forum) we speculated that the phrase may have come from a commercial of sorts. Something a kin to the "Where's the Beef" campaign of the 80's. But if any one has any more info about the phrase, send it my way. I'd like to know where it trully came from. Lastly, I know, I know, I've done more news updates than anything else. Reason is my life is crazy and my weekends are booked solid. I will try to get in an update of some new images and POSSIBLY new sounds sometime this month. A friend of mine just emailed me this link today, the 16th of June. It's in response to the lawsuit involving Spike Lee and TNN/Spike TV. Why does this have any baring on Tom and Jerry? Well, the beloved character of Spike the Bulldog is set to sue Spike Lee..read the Article from MSNBC.com. Very funny article! Some very good news and some news to approach with caution. Today is the Friday the 13th, oooo scary! And in keeping with that theme I just found out that Warner Brothers is releasing "Tom And Jerry: Hijinks And Shrieks" on August 19. I don't know what is going to be on this DVD or not. The 3 dvd sites I went to don't have much info on the content. That's the good news. Thanks Brett! "Warner Home Video has revealed that in late 2003/2004, Complete, Chronological, Uncut theatrical Tom & Jerry cartoons are coming to DVD. They are being restored by cartoon historians, who are also doing major restorations to all classic Warner Brothers cartoons (and now, they are doing some Popeye cartoons). The previous DVD releases and the one in August were put together by a different group, which was associated with Warner Family Entertainment. Well, Warner has realized their mistake and the WB and Tom & Jerry cartoons will be done by the Warner Home Video group from now on (NOT THE FAMILY ONE!! ), with 'oodles of extras aimed at animation fans' (said a WHV worker)." Thanks Dan for the info! My friends and fellow Tom and Jerry fans. The time has come for us to let our voices be heard. I have received many a email in the five years I've run this site. And in those emails, the fans have wondered, "Where can I buy these cartoons?". I have answered these emails, with sorrow on my heart, "Video releases are few and far between and what has been released isn't much". I, for one, am tired of the lack of availablity of Tom and Jerry cartoons. Sure there are ways of getting the cartoons, Cartoon Network is one of them. But if FOX can release the Simpons on DVD (albeit verrry slowly), why can't WARNER do the same for Tom and Jerry. What do I propose? A grass roots movement, since I don't know what else to do. Fellow Tom and Jerry fan, Kamrano and myself have started a Petition. Now, I know some of you may be rolling your eyes at this point and I understand...but dang it, it is worth a shot. Maybe just maybe, we can let some Marketing Person know that there is a fan base and a market for a Tom and Jerry DVD Box set! Thanks Kamrano for getting me to do this petition! Rome, steps off the soapbox. After you have thanked a Veteran today, stop on over to the Games area and check out the screenshots of "War of Whiskers" I grabed from Gamespot.com. There are 35 screen shots. Enjoy. UPDATE: later today...still reorganizing my machine and still discovering things I didn't know I had. I was able to clean up a production drawing of Tom and I added it to the coloring section. ENJOY! Anyway, as I was re-organizing my computer I stumbled upon a wallpaper that I downloaded from Cartoon Network's website. I don't know where I found it or when I downloaded it, but I'm going to share it with you. So, today the 23rd of May, I give you a wallpaper. It's the last one on the page. I have a some screen shots of the PS2 game, Tom and Jerry: War of Whiskers, somewhere on this machine (hence the re-organization since I can't find anything any more). Once I find those screen shots, I'll be putting them. Until then have a great Memorial Day weekend! HAPPY EASTWA!!!! as Little Quacker puts. Well I hope that you all are having an awesome Sunday, April 20! I just opened up my email box and low and behold I got a wonderful "Easter Egg" if you will. Tom and Jerry Online has been awarded "Best New Link This Week" on About Classic Movies site which I think is pretty cool. If you get a chance and are into Classic Movies, go check them out! Also, I finally had the time to sit down and watch the Mansion Cat. This is the short that was made in 2000. I don't know what to make of it. I need to see it a few more times before I can give my full impression of the short. Today is the first full week of April. Yeah! Anyway, nothing new to report or add or anything. Just felt like mentioning this: For those that have been coming to the site alot may remember last summer that TV Guide ran a poll for the greatest cartoon characters of all time. Check out the July 30, 2002 new posts if you want to see what transpired with that. Basically we were able to make Tom and Jerry number one. Anyway, I went back to the site recently and found that they are on the number three spot. Anyway, here's the link to the TV Guide Poll. A little late but there still is time! Aaron over at The New Tom and Jerry Information Site sent this little note to me: "from March 30-April 5, Boomerang (it's their 3rd anniversary!) is showing TV's largest tribute to Tom & Jerry with a weeklong Marathon; plus, T&J will be Boomerang's featured stars every Friday this month!" This is Awesome news! However, I do not have the Boomerang Network so I'll be missing all the fun. For those 10 of you that do have Boomerang, enjoy! Thanks for the info, Aaron! I think I'm going to make some people really happy and some really upset. How so? Well, I was sniffing around ebay for the sake of looking and I found something that many of you have been emailing me about. I'm posting this news on March 30, 2003 and the time is 4:36PM EST adn there is 4 hours left in the auction for a Tom and Jerry plush toy!!! I'm not running this auction, but I thought I'd share it with you. Good Luck! Did a few additions..this last weekend of March...man, this is becoming a habit! 1. http://www.moviegoods.com/movie_product.asp?master_movie_id=11895. This place has a Cartoon movie poster book. What caught my eye was a Tom and Jerry movie poster on the front cover :-] Don't know how many are in the book, but it doesn't hurt to take a look. By the way, if anyone can tell me which Tom and Jerry cartoon this IMAGE is from, you will make me a happy camper! March the 22nd, the day after Spring. Added some info about Shug Fisher, the voice actor for Uncle Pecos. I've also added an area for the Crew, the people involved with Tom and Jerry. I only have a few people so far, but eventually I'd like to put more in there. Anyway, it's here: The Crew. I've added 3 pictures to the gallery. 2 pics that have been added are scans from a boc of Tom and Jerry fruit snacks. The fruit snacks were found at a Safeway in Colorado and they are a Safeway brand. So if you have any Safeway's near your home go there and get these snacks! Thank you for the scans, Alan! I have also adding one of Mammy Two Shoes. This is a rare one INDEED! The pic that is up actually shows a portion of Mammy's face! Thanks Jerry, for the image! Many Thanks to Alan, ThoreauRug, Jerry and Dave for supplying me with info and stuff to update the site. Happy Saint Patty's day! As luck would have it...an update! I've put up cover art in the games section. Enjoy! The new gallery is up and running smoothly. I think I've fixed all the broken links and I've reorganized a few things as well..."cleaned house" so to speak. Anyway, there are 7 new images that I've put up. They are on last page. If you come across any broken picture links or something let me know. Febrauary 15, the day after Valentines. The Picture Gallery is going to be down for little bit today. As promised, I'm working on the gallery area to make it more efficient for me and make it easier to update. So it's going to be a bit messy for a couple of hours...Please bear with me. Opportunity knocks this Valentines Day! Melissa Uhniat, an Associate Producer for Nancy Glass Productions, which produces the show "Ultimate Collector" for Home and Garden Television, is are looking for the ultimate Tom and Jerry collector in the Philadelphia and surrouding areas. They are at the end of this season and will be shooting their last segements until the end of February. They would love to do a segment on someone who has a varied collection of Tom and Jerry memorabilia. The picture quality is great considering how old some of the prints are. The sound isn't too shabby either. It's in stereo from its original mono sound so for those of us that grew up with them it's sort of an improvement in that it is cleaner. Everything is uncut, for the most part. Just like the previous DVD, The Greatest Chases, you can select Play all and watch all 10 toons straight through. Extras include How to Draw Tom and Jerry and some trailers, nothing spectactular. How to Draw Tom and Jerry was a BIG slap in the face! What a cruel joke! I'm sorry, but I was really excited about this special feature when I heard about. That excitment fell to the earth like an anvil on Tom's head! We are given a 1 minute 40 second speed drawing of Tom and Jerry. That is it! ARGH!!!! Scooby Doo and the Legend of the Vampire. I only wish they'd promote Tom and Jerry as much as Scooby Doo. This thing was only about 10 seconds so why is it on this DVD?!?! Virginia's Run. UGH! Sappy and contrived from the looks of it. Looks like an "After School Special" without the message. Rome approaches the Soapbox and a hush falls over the crowd. Fear and dread set in as he is about to type. The trailers, why? 5 trailers! Come on! Forget the trailers and give me some stuff about Tom and Jerry! About the "uncut, for the most part" comment..all were uncut, except "Mucho Mouse". The toon was originally in Cinemascope meaning letterbox! It is not letterboxed on the DVD..WHY NOT?!?! Ugh is it too much to ask to get the Cinemascope Tom and Jerry's in letterbox?? I have never seen them in their original format of letterbox. Nor have many, many other people who didn't see them in the theaters over 40 years ago. Please someone explain this to me! Fans such as myself would love to see these Tom and Jerry cartoons they their creators wanted them shown. I feel like I'm biting the hand the feeds me. That they release a Tom and Jerry DVD and I do nothing but complain about what I feel should be on it. I apologize for that. I am grateful that Tom and Jerry DVDs are released. Personally, though, I feel like I am being fed scraps from a large banquet table. The Japanese have a box set of all the episodes. VCD's are common in many parts of the world and there are a lot of Tom and Jerry VCDs. But here we aren't given much. Cartoon Network shows Tom and Jerry at odd hours of the day so that is something, but not everyone has Cartoon Network. Besides, PC thugs like to edit Tom and Jerry...a subject that I don't want to get into. Please, those of you that have control of these cartoons, I'm asking you, begging you, give us more! Tom and Jerry merchandise of any kinda is few and far between. Episodes on VHS and DVD is very rare, even with the latest release. I'm sure a lot of the loyal Tom and Jerry fans would love to see a DVD release in box set that does honor to their legacy in the history of animation. Something that does justice to those that worked on it for so many year. An anthology if you will! Hanna-barbera early years, the Gene Deitch years, the Chuck Jones years, the later Hanna-barbera years. All uncut, digitally remastered! Let us know what went on it, give us a documentary along with it. The books they were publised about these cartoons are no longer in print! Information is sparse! And I am rambling...time to get off this soapbox. I bought Whiskers Away last night! I haven't watched it yet, but it is out on DVD, so go out and buy it!!! In the next couple of weeks or so I'm going to be changing a few things around. Mostly in the gallery area. I'm going to be reorganizing all the images and make the gallery function a little diffrently and more efficiently. Plus, it will help me out quite a bit on the coding front. The only thing that will be affected are the link stealers. The gallery change isn't because of you guys, I don't mind too much (just give me some credit) it's that the gallery, and the site for that matter, has gotten large to the point of needing a little tweeking to make things easier for me to update and manage. With the coming of Spring and the season of the Oscars I put up a page about the Tom and Jerry cartoons that have been nominated and that have won the award. I have a few images that I'll eventually put up. Look for them in the next couple of days. Mark your calendars for the February 11th or just pre-order it now! 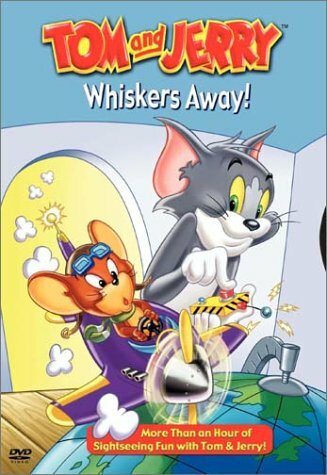 "Tom and Jerry: Whiskers Away follows the duo from Italy to Texas and everywhere in between with these 10 action-packed cartoons that showcase the best traps and funniest escapes in animation history. At 72 minutes, the DVD has special features such as How to Draw Tom and Jerry and trailers." I heard a rumor that Pecos Pest might be on it, but from what I got on Amazon it looks like it might not be. I guess I'll just have to buy the DVD and find out. DANG IT!!! The rest of the world gets these products and we here in the states get hosed! Forgive my bitterness, but as I was surfing aound looking up information for a client I stumble upon some more products. Are they in the States? NOPE! They are out in England. I know, I know, I haven't done a major update in a long, long time. Well I have an exscuse...The Super Bowl is coming up and I am through a huge party so that is taking up some priority :-] Anyway, I should get some more images up in the next couple of weeks. So to make up for it, I found some interesting links that I need to share. While search for some information for someone who just emailed me today, the 21st day of the first month of the new year, I stumbled upon merchandise galore! http://shopping.tiscali.de/browse.php?cat=9640 - soooo much stuff! clothes, hats, cups, mugs, etc. The one thing that eludes me and pains me to say that I can't find are Tom and Jerry stuffed toys. I've had a lot of emails about this and I just don't know where to tell people to find them...aside from ebay. So...if anyone knows where Tom and Jerry stuffed toys are being sold online, please let me know! Today I added 2 new coloring images. Well, Happy New year! A new year, a new update! Today is the 5th day of the new year and I have added a new section to the Tom and Jerry site. I've added a coloring section! I only have 2 images in the section, hopefully I will be able to find some more to add. This section is going to have "outlined" images for coloring purposes. So, for those of you looking for coloring books for your kids and are frustrated with the lack of them, try the next best thing and head over to the Coloring area and print some things out for your kids to color. Also, January marks a wonderful milestone: 5 fun filled years of the Tom and Jerry Dedication Page/Tom and Jerry Online. Happy Birthday Tom and Jerry Online, from me, Rome! Thanks to all for being a part of this site for these years.